Discussion in 'Online Casino Promotions' started by Kotsy, May 4, 2014. Just love May's Game of the Month at Win A Day Casino!! 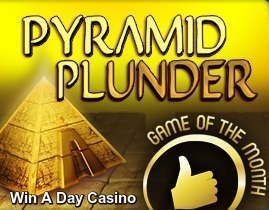 You could win up to $250 just for playing Pyramid Plunder at Win A Day Casino. Log in at Win A Day Casino and start playing Pyramid Plunder online video slot. Every time you play 500 rounds (spins) you will earn one ticket into a random draw. The more you play, the more tickets you'll earn for a chance to win some cash! At the start of June, one lucky winner will receive $250, one will receive $100 and 3 players will receive $50. You must play Pyramid Plunder from May 1 till May 31. Winners will be announce by June 14th. If you happen to be a VIP player and win, your winnings will be doubled. I love Pyramid Plunder online video slot. It has 25 payline and 3 incredible bonus features that include Maps, the Mummy's Surprise or the Golden Scarab's spell. Log in and deposit today to play this fantastic video slot.